The Building the Sales Pipeline training will give you a step-by-step process of how to close more business and better business. How to increase your top-line revenues and profitability by closing the business you want to have, not just the business you can have. This session will be given in a highly interactive and upbeat manner. Each attendee will be provided with the knowledge and the tools to actually convert this knowledge into immediate action and create measurable results. 1. Understanding the three legs of selling and which one is most often missed. 2. Common prospecting miscues and how to solve them. 3. The fear of prospecting and the “million-pound-phone” and how to make if work for you, not against you. 4. The selling truths (the 10% and 80% factors). 5. The six-touch system beats the “3 and out” every time. 6. Stack, pack and attack (planning your work and working your plan). • Focus more on the front-end and middle activities and less on sales and you will close more business. • Break the process down to gain clarity. • How to track and measure your personal activities to book more business. 8. Learn to develop voice messages that differentiates your from your competition, creates curiosity and motivates your target prospect to want to talk with you. 9. How to write emails that are opened, read and ACTED upon. Length of the session is 4 hours. Bob is a business coach, a results driven trainer and a new business development consultant to the hospitality industry and has been in business for over 20 years. A featured speaker whose entertaining and upbeat presentation style has earned him rave reviews from many hospitality organizations. Bob has been married for 29 years and has three wonderful children. When not conducting training seminars and webinars, he likes to read, work out and play hockey. Bob Anderson is one of our most requested speakers to bring back to our chapter. 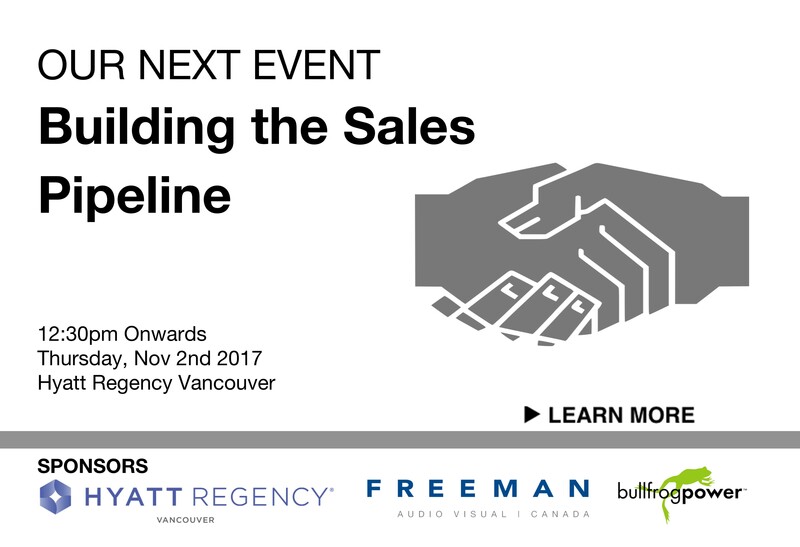 His workshop Building the Sales Pipeline is an interactive presentation allowing you to start and practice some of the skills trained during the seminar. When you leave, he gives you key takeaways that you can bring back to your business and put into action RIGHT AWAY! Bob’s training is engaging and most importantly, it works! After Bob’s presentation, I had the game plan and all the tools I needed to build out my pipeline, and the only thing left to do was execute. For me, prospecting was challenging because of the lack of structure and therefore lack of confidence I had in my prospecting process. Bob’s presentation helped me build out many great prospecting tools (templates, call scripts, e-mails, etc.) and laid out an easy to follow plan. The session was great in that it helped me develop a better awareness and understanding of the supplier/buyer relationship and what causes buyers to engage with salespeople. With Bob’s help, I’ve been able to awaken many unresponsive prospects and I feel much more confident about prospecting for new business. Not only is the content great, but Bob’s delivery is entertaining and engaging.